Game Day Preview Canucks vs. Flames: Has Torts Lost The Room? 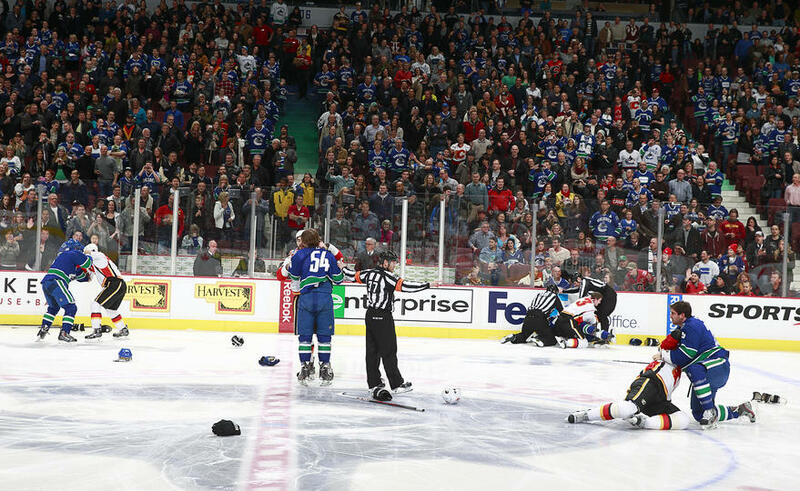 The line brawl between the Vancouver Canucks and the Calgary Flames that started their last game. After an embarrassing 6-1 loss to the Dallas Stars on Thursday night, the Vancouver Canucks return home for a two-game home-stand. They’ve only been away for a week, but, man, has so much happened since the last time they were in town. It’s hard to believe that the Ryan Kesler trade saga, the Heritage Classic goaltending fiasco, and Roberto Luongo’s subsequent trade to the Florida Panthers at the trade deadline all happened in the last week. Welcome home, boys. March 8 is a dark day in Canucks history. Exactly 10 years ago today, in a game against the Colorado Avalanche, Todd Bertuzzi jumped Steve Moore, who then suffered a career-ending injury. And wouldn’t you know it, but today is also the first meeting between the Canucks and the Calgary Flames since their line brawl on January 18th started the game, and Mt. Tortorella erupted during the first intermission and had to be restrained from entering the Flames’ dressing room. Torts was suspended 15 days by the NHL for his actions. The Canucks have won 5 in a row against the Calgary Flames, including all 3 games they’ve played this season. But truth be told, unlike the Canucks, who are sinking faster than Lindsay Lohan’s once promising career, the Flames are headed in the right direction. Since that January 18th meeting against the Canucks, they’ve won 9 of 15 games. They’ve scored 4 or more goals in 7 of those 15 games, and have allowed 2 goals or less in 8 of them. On the other hand, the Canucks have won just 3 games since Mt. Torts’ eruption (3-11-1), and have only scored 24 goals in those 15 games. There were some reports Canucks players, especially the veterans, were upset at Tortorella for his actions that night, and looking at the results since, the question needs to be asked: Has Torts lost the room? As the Canucks struggle to score, of course they also struggle to win. Heading into tonight’s game, the Canucks have scored 148 goals. The fewest number of goals ever scored by a Canucks team in a full season were the 192 scored by the 1989-1999 Canucks. To beat that number, the Canucks need 45 goals in their final 17 games – that’s asking the team to score a 2.64 goals per game pace over the final 17 games of the season when they’ve averaged 1.53 goals per game in the last 17 games they’ve played. For those keeping track, Captain Henrik Sedin has not scored a goal in his last 22 games and is without a point in his last 11 games. Although he’s injured right now, Daniel Sedin has also not scored in his last 22 games and has just one point in his last 17 games. Alex Burrows has yet to score a goal this season.